Way back in 2011-12, I wrote a few posts for HP about the application of 3D printing for housing, both on earth and in space (unfortunately, I couldn’t even find those posts on the wayback machine). This week there was a post about 3D printed housing at SXSW that demonstrated printing a livable small home in 24 hours (or a bit more) at a relatively low cost. Hope we’ll see more of this in the future. It all went smoothly EXCEPT I lost everything that was pinned to my start menu. If I were to do it again, I’d take a screen snapshot before installing the update. All the programs were still loaded and working, they just were not arranged on my start menu anymore. The update does take much longer than the normal monthly upgrade. Other than having a few issues with the initial calibration, it is working great. I ordered some additional filament from MCM Electronics (since I was ordering other stuff anyway), so I should have some color options soon. Overall, the quality is improved and the reliability is significantly better than the previous generation of printer. I’ve printed a number of items more reliably and with better finish than ever before. 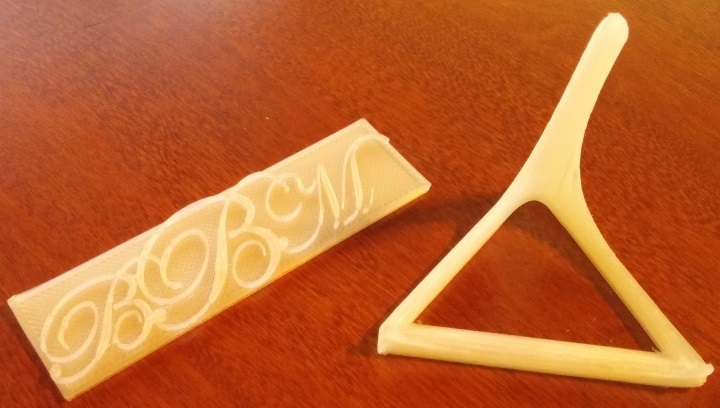 The first is a fairly detailed print of my daughters monogram and the 2nd is a phone stand. So far, I’ve still been using Repetier and Slic3r to generate the g-code and drive the printer. I’ve owned a PrinterBot LC for a number of years now and have extruded some interesting and complex models. After years of calibration, modification and tuning, it functioned well, printing reliably. 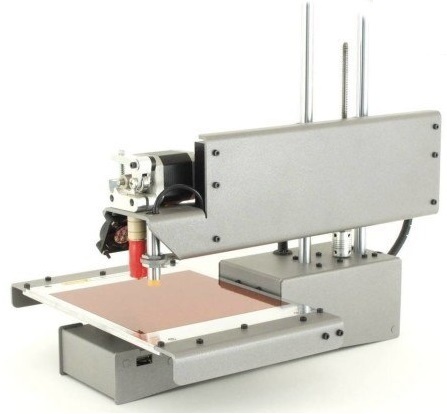 I’ve decided it is time to sell it though and purchase a newer (capable of slightly larger output) model 3D printer, a PrintrBot Simple Metal. This one I purchased assembled, since I’ll soon will not have much free time (more about that later) and wanted to get some experience while I could. The LC came in literally thousands of pieces, this one is definitely a much more streamlined design. I’ll definitely be writing some posts about the unboxing and calibration experience here. Fortunately, I have numerous calibration models I’ve made over the years, as well as a great deal of experience (and sweat and frustration) to bring to bear on challenge.